New website design and build alert! A summer in the making, Spring was brought onboard following a three way pitch to deliver a new website for Haverhill Arts Centre, Suffolk. With leading headline acts such as comedian Ardal O’Hanlon (Father Ted), Phil Jupitus (Never Mind the Buzzcocks) and popular West End shows especially adapted and streamed on their cinema screen like The King and I, it was key that the Arts Centre gave people a great experience from the moment they browse for tickets to attending the show. Our approach combined form and function, bringing in a new colour palette with the use of gradient to inject personality without affecting the contrast of the content, and creating a fully responsive site that would help improve the user experience and make it easier to book on mobile devices. 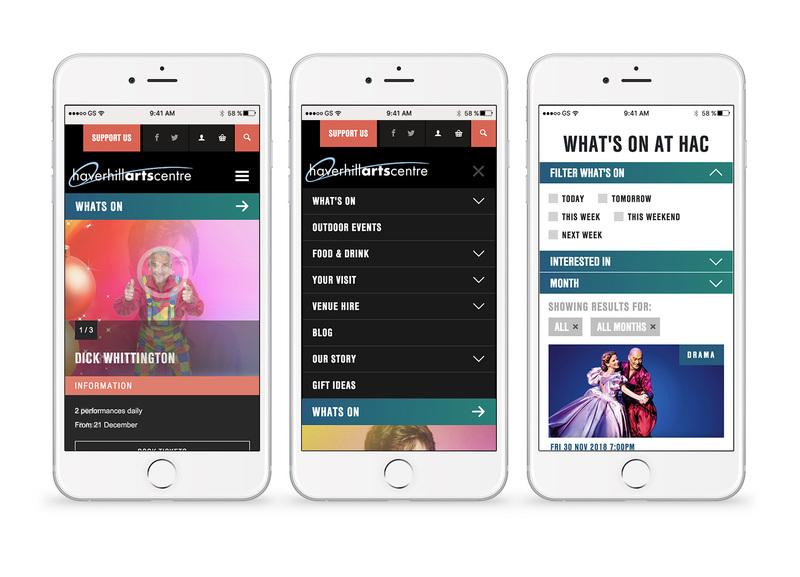 Managing the website has also been made easier with the integration of event management and ticket booking system Spektrix, to ensure a streamlined process and simplification of content entry. A WordPress CMS system based on a drag-and-drop builder makes pages easy to create and flexible to match varied requirements. Public feedback has been positive and the site is already taking bookings with ease.